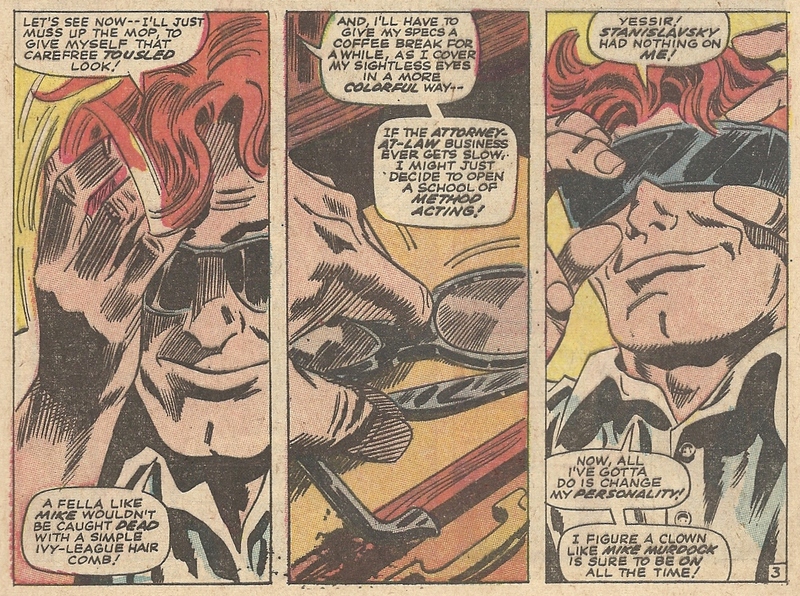 I’ve always pictured Matt Murdock as a man of dignity. Maybe it’s his work in the legal profession — having a J.D. myself, I can respect a hero that put up with the expensive bologna that is law school. Moreover, he’s a champion of the meek and oppressed in both of his personas. Both personas? Wait, I forgot one. Yes, his twin brother Mike. 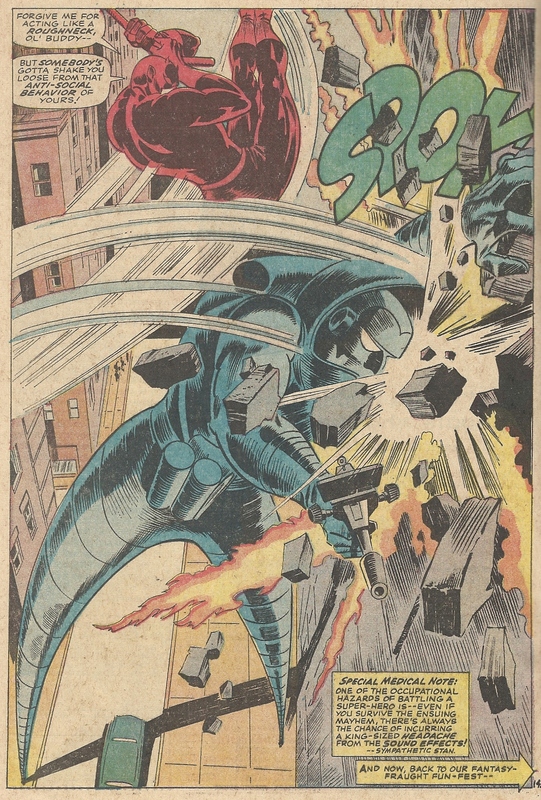 “Mike” was Matt’s way in the previous issue (#25) to draw heat away from himself when it came to protecting his secret identity. Okay, I can understand that. You get caught with your superhero pants down, you panic, and you come up with the lamest scheme possible to cover your tracks. “No, Daredevil isn’t me, he’s my twin.” But, in his quest to differentiate this persona from himself, Matt managed to make Mike the most irritating human being on the face of the Earth. Ever. Of all time. The James Cagney impersonation might be the straw that broke the blogger’s back. Enough of this guy. It’s with great relief that I note that this book has some real action in it. 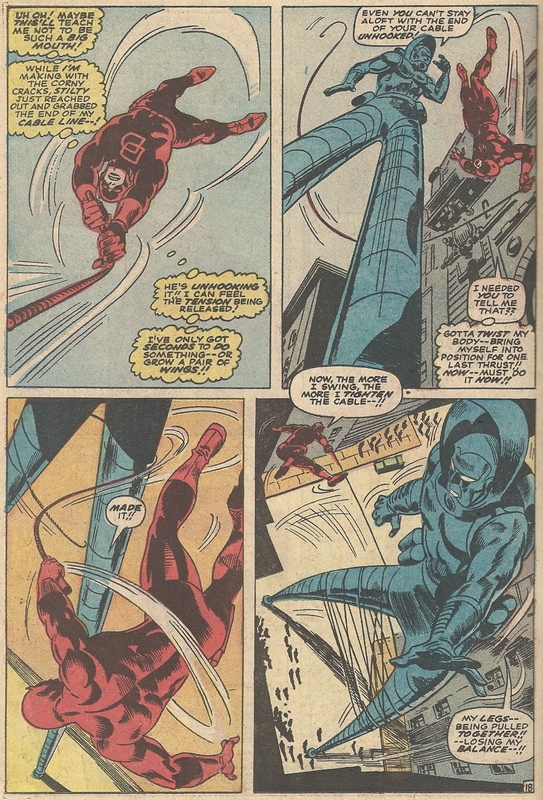 Matt — I mean Mike — changes into Daredevil and goes after him, and Stilt-Man providentially shows up to recruit Leap-Frog to his evil cause. 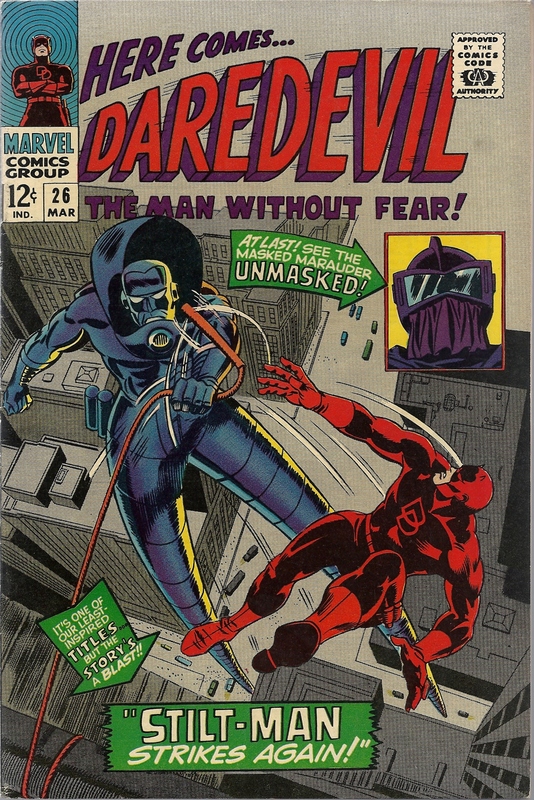 Daredevil and Stilt-Man then battle it out. There’s always been something menacing about this particular villain, something that goes beyond his main “I can adjust my stature” ability. It has to be the primal quality of the height — no one likes having someone looming over them, I guess. I’ve always liked the things that Colan did (and does) with perspective, and there’s no better character to bring that out than Stilt-Man. That’s pretty much where the story ends. Yes, he was a real lawyer. The cover tease about the identity of the Masked Marauder? The reveal’s lame, and Stan even admits that it’s lame in an editorial aside during the story. So let’s leave it at that. Wasn’t Captain America’s “Let’s Rap with Cap”? That might be a close second. Anyway, I’ll end with this — I hope that, should anyone ever stumble upon my double life as the head of the Blog into Mystery internet empire, I don’t try to hide behind the facade of my imaginary twin. And if I do go down that dark path, I won’t — I WON’T — do James Cagney impersonations. I promise. I too hate Mike Murdock. Admittedly this confession adds nothing to the debate but I can simply never turn down the chance to say I hate Mike Murdock. I rather like this and the next issue which forms the conclusion to the 2-parter. For some reason I have acquired nearly every appearance of Stilt-Man (umm, maybe I shouldn’t have admitted that) and I think this story arc is probably the best one. 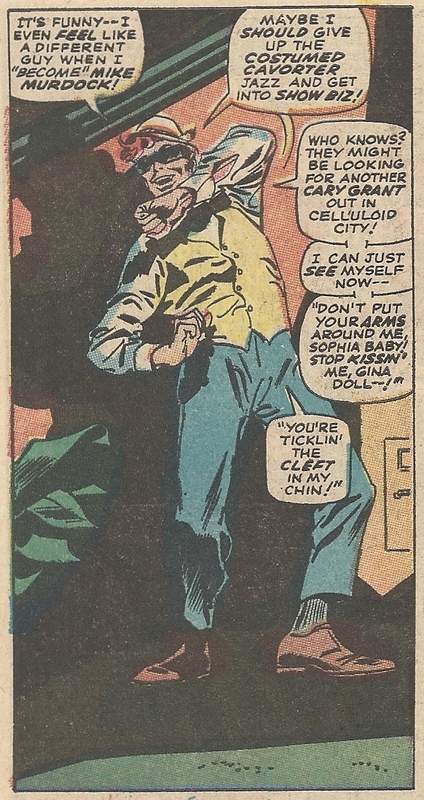 Never since has Stilt-Man been so menacing, or at all menacing, for that matter. Although ASM #237, where he realizes what a loser villain he is, is also pretty good. It’s funny, Amazing #237 popped into my head when I wrote the post. That was my first encounter with Stilt-Man. I love Mike! Stan Lee at full, unrestrained cornballedness–would we want him any other way? I have a post coming on Mike Murdock tomorrow. While I agree that Stan overdid it, there is an appeal to being able to throw on a new personality–brash, cocky and arrogant–to teen-aged boys. At least there was to me. I definitely see what you’re saying. I’m afraid that Mike crosses a line, the one that separates “brash and cocky” from — pardon my French — “annoying douche.” He’s still kind of entertaining in amped up stupidity, though. I have to admit it. 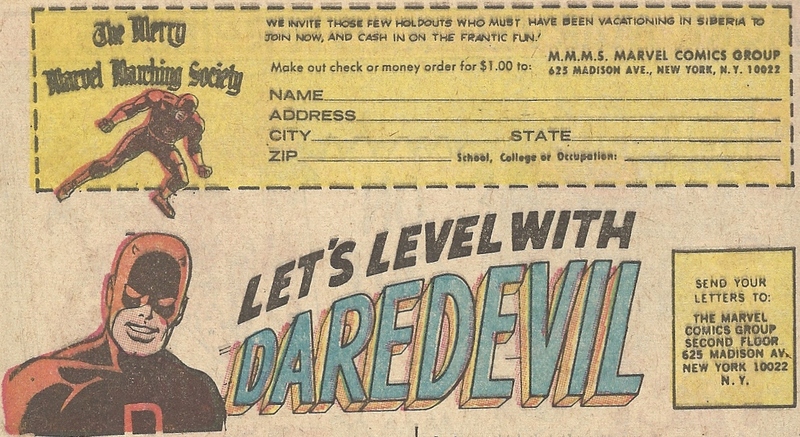 Oh, BTW, the original name for the Captain America letter col was “Let’s Yap with Cap”; the Rap bit came a bit later. Mike Murdock was soooooooo WACK! Can the Forgotten Prisoner of Castlemare truly be forgotten if no one knows who the hell he is in the first place?